It looks like Genesis is going back out on the road. Phil, Mike, and Tony will be doing 20 shows in Europe and 20 in the US for the “Turn It On Again” tour of 2007. 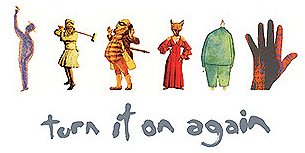 Originally, the five members from the classic ’70s lineup met to see if they could schedule a set of shows of “The Lamb Lies Down on Broadway”, but Peter Gabriel declined due to scheduling conflicts. 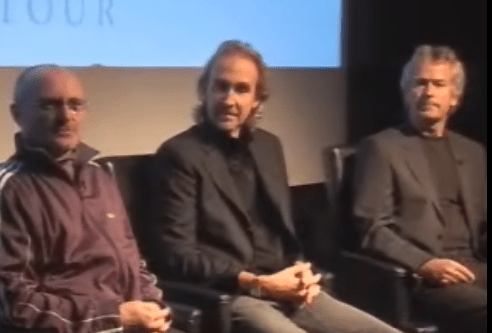 With Peter out, it didn’t make sense to include Steve Hackett as the four member version of Genesis was only a tiny slice out of their history. You can view their news conference where they discuss all of this from this shiny link. With just 20 shows in the US, I don’t have my hopes up for a local appearance. I had a nice little surprise in my email yesterday. 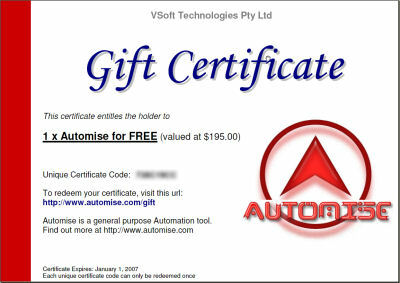 It was a gift certificate from VSoft Technologies for a one free license for Automise. Evidently I received it because I own a license for FinalBuilder, a fantastic tool for automating product builds. With FinalBuilder, I can create a new build of one our applications from source control, through compiling, to building the installers, to sending out email to all interested parties that a new build is out. Automise is basically FinalBuilder, but without the compiler specific tools. If you have a batch process that uses a motley collection of batch files and command line tools, then Automise will make your life simpler.